Although lean methodologies were born in manufacturing plants, this approach to project management has become far more widespread and is now used in a variety of industries, including construction. While implementing and adhering to lean practices is easier in a manufacturing setting because of its fixed production processes, predictable material needs, and repetitive procedures, construction operations don’t benefit from these qualities. On the contrary, most building projects are customized, designs are not created for multiple uses, workforces are transient, materials change frequently, and partnerships with suppliers and subcontractors are formed and broken on a regular basis. 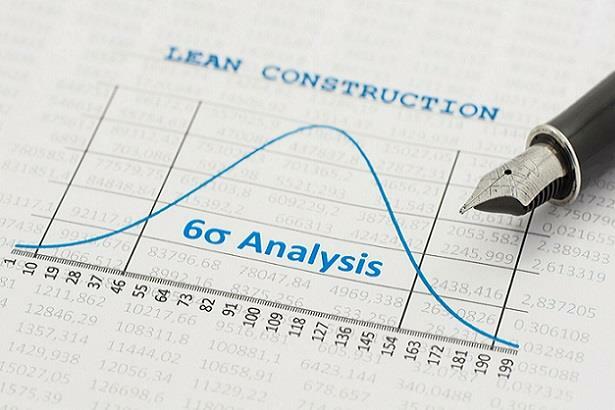 For these reasons, applying lean principles to a construction enterprise can pose unique challenges, but the long-term gains of embracing this production methodology are significant. Review the short list of advantages and disadvantages below to help decide if your business should utilize lean thinking. Increased efficiency – Two vital elements of lean construction are waste elimination and continuous improvement. It’s important to note that “waste” doesn’t just refer to scrap materials; underutilized resources and misspent time also constitute waste. By creating defined work processes, expanding project planning, devising a coherent strategic vision, employing visual management devices, and instituting practices such as 5S (Sort, Streamline, Sanitize, Standardize, Sustain), you will be able to enhance productivity by cutting wasted resources, time, and materials. Higher quality – It’s been said that a key difference between manufacturing and construction is that in the former quality is “built in” while in the latter it is “inspected in.” In reality, this is tied directly to employee empowerment. The idea that any employee, from the newest line worker to the top executive, has the power to “stop the line” in an assembly operation can be directly attributed to the lean methodology. If this principle is transferred to construction and embraced throughout an organization, it will result in significant, and continuous, quality improvements. Elevated customer satisfaction – With higher quality and increased efficiency come greater client satisfaction. A critical element of the lean approach is the definition of value, both from the standpoint of the customer and the business. In the manufacturing realm, the operation’s goal is to create a product that will fulfill consumer needs based on research and prior experience. In construction, on the other hand, the process is more give and take. The business and customer work together to create a definition of value for a project and in some instances, it is the role of contractor to assist the owner in determining what they need rather than what they want. The more intimate client relationship that lean construction requires naturally leads to better relations once the project has been completed on time and within budget. Boosted profits and reduced costs – Streamlined work processes will inevitably raise profitability, but the lean approach to project management takes it a step further by focusing on all of the ways costs can be trimmed from the minimization of defects to making sure that no unnecessary materials are purchased. Excessive movement of supplies, avoidable delays, wasted resources, and superfluous or unessential equipment are all “sins” that will be uncovered and rectified by adhering to lean principles. More employee accountability – When a company “goes lean,” one of the major changes is the establishment of very specific performance measurements. Tracking the success or failure of initiatives is critical to monitoring operational health and gauging the impact the lean approach has had on the business. This close observation also provides insight into the contributions of individual team members and can help determine if further training or other intervention is needed. Improved safety – By employing organization and standardization strategies like uniform tool storage and common worksite configurations as well as utilizing error-proofing and visual management devices such as directional piece marks, welding fixtures, traffic signs, and work zone assignments, lean construction companies have achieved noticeable reductions in accidents and lost-time injuries. Closer partnerships, better communication – Lean construction compels team members and stakeholders to work closely with one another, making coordination and communication key to success. The whole operation (contractor, subcontractor, suppliers, and customers) must be involved in value engineering, production planning, organizational learning, and defect prevention. Team unity, commitment, and focus required – For the lean approach to be successful, all parties must be dedicated to a common goal and prepared to stick with this methodology for the long haul. Becoming a lean construction company is an ongoing effort, not a project with a start and end date. A weak link can threaten any possible gains, and this stretches beyond just immediate team members and employees. Subcontractors and suppliers must also be committed to making the lean management style work and understand the part they have to play in the project as a whole. Immediate results are uncommon – Similar to the potential roadblock discussed above, any partners who are searching for instant gratification from the adoption of lean principles will be severely disappointed. It takes time to see the full effects of this production management technique and although noticeable quality improvements should be quick to manifest themselves, increases to profitability will be more gradual. Training requires significant investment of time/resources – As with implementing any major change in direction, adopting lean principles will entail much time spent instructing your workforce on new policies, procedures, and strategies. One difference with lean construction, however, is the need to educate suppliers, subcontractors, and even clients. This will take an exceptional amount of time and energy and should not be overlooked. Some team members and partners may be resistant to change – It bears repeating that for a lean construction operation to work, everyone involved needs to be on board and focused on the same goal. If employees have not bought into the change in direction, performance will be affected and the business may suffer. This will lead to tough personnel decisions, and it may be better to cut ties with team members who could negatively impact morale rather than attempting to convince them of the merits of contributing to a collective effort. Pressure on management – Responsibility for the success or failure of implementation will rest with management and their ability to communicate goals and guide the workforce. Senior leadership will also be forced to keep a close watch on projects as they progress while analyzing key performance indicators and assessing the status of individual teams and the entire business. Current projects could suffer – If your company is in the middle of a project while trying to adopt a lean approach, careful coordination will be needed to ensure that the transition to a new production philosophy – and the training that will require – does not affect quality or customer relations. Impact on employee morale – As mentioned above, it’s human nature to be wary of significant disruptions to the status quo. For this reason, as your company begins to transition to a lean environment, you may have to deal with a dip in morale from employees who struggle to handle the new approach. These declines in staff satisfaction are usually temporary, however, as personnel adjust to the new status quo and settle into their roles.